Who was Chief Pontiac and why was this Native Indian chief famous? Summary: Chief Pontiac ( 1720 - 1769 was a leader of the Ottawa tribe who resisted British settlement of the Great Lakes region during Pontiac's War (1763–1766). Chief Pontiac was a fierce war chief an military strategist. His rebellion against the British failed and he was murdered three years later by a Peoria Native Indian in a revenge killing. The following fact sheet contains interesting facts, background history and information about the life of Chief Pontiac and the events in history that led to his fame as a great Native American Indian leader. He The story of Chief Pontiac is one of those stories that have been based on much speculation and legend. 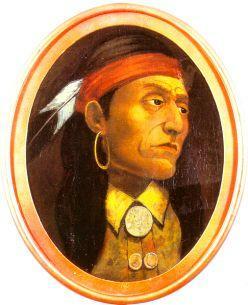 Chief Pontiac was part of the Ottawa Indian tribe and was born into the tribe in the year 1720. These speculations include the affiliation of his parents, where he was actually born, or whether or not he was actually born as an Ottawa Indian. One of speculation of the latest says that Chief Pontiac was a prisoner captured from one of the Ottawa’s tribal opponents. They eventually adopted him as part of the tribe. No matter what his history was before his clashes with the British, he still went down as one of Ottawa tribe’s most famous 'Chiefs'. Chief Pontiac was a member of the Council of Three Tribes consisting of Ottawa, Potawatomi, and the Ojibwa (Chippewa) tribes. These, and many other tribes of Native Indians had made a strong trading and political relationship with the French. They were therefore closely allied to the French in their wars and battles with the British during the conflict known as the French and Indian War (1754–1763). The Ottawa tribe joined in the attack upon General Braddock's column, and Chief Pontiac led them in the French victory of July 9, 1755. The French Indian War (1754-1763) ended in defeat for the French in 1763. New France was lost to the British who proceeded to occupy the various forts in the Ohio Country and Great Lakes region previously garrisoned by the French. The British occupation led to conflict with the Native Indians who were treated like conquered enemies. Back in those days, the Ottawa Indians never had a chief, and the British also thought the same. However, they have already heard of the name Chief Pontiac from many sources. With this notoriety, the British thought of him as the chief of the tribe and he accepted it gladly. His status with the Europeans angered some of other Native Indian leaders. His fame increased when he entered what became known as “Pontiac’s War” (1763–1766). The rebellion planned by Pontiac started with his drive to take Detroit from the British. He encouraged different tribe leaders from the Great Lakes region to join him in taking up arms against the British. Pontiac's plan was simple; take as many forts as possible and destroy the British settlements. It was a policy of extermination. Each of the tribe leaders was assigned to one fort. Fifteen British forts were taken of which twelve were completely destroyed. Others, including Fort Detroit and Fort Pitt, were besieged. French settlers also joined in the war providing additional weapons and man power. The initial phase of the rebellion a great success for the Native Indian alliance. They were able to take more than half of the forts in the surrounding areas. They tried to intimidate British troops by putting the bodies killed by the tribes in full display. The next phase was to starve the people in Fort Detroit to death. The Battle of Bloody Run was fought during Pontiac's War on July 31, 1763 in a failed British attempt to break Pontiac's siege of Fort Detroit. The creek, or run, was said to have run red with the blood of the dead. After laying siege to Fort Detroit for many months the French started to side with the British and Chief Pontiac learned that France had signed a peace treaty with Great Britain. The loss of his French allies effectively ended Pontiac's War. On July 25, 1766, Pontiac signed a peace treaty at Oswego, New York. Pontiac's War failed but the rebellion of the Native Indian tribes hastened the implementation of the Royal Proclamation of 1763 that established a massive boundary called the Proclamation Line. The Proclamation of 1763 was designed to calm the fears of American Native Indians by halting the westward expansion of colonists whilst expanding the lucrative fur trade. In 1768, he was forced to leave his Ottawa village on the Maumee River, and relocated near Ouiatenon on the Wabash River. While he was visiting Cahokia, Illinois, in an attempt to unite the tribes of the Mississippi Valley, he was murdered by a Peoria Indian on April 20, 1769. It was a revenge killing for a past skirmish. For additional facts and information refer to the legend and the Story of Chief Pontiac.